A term for a variety of techniques where medications (anesthetic gases, intravenous medications) are used to render the patient unconscious, unable to respond to noxious stimulation and unable to remember. General anesthesia can be accomplished with one medication or combination of many medications. 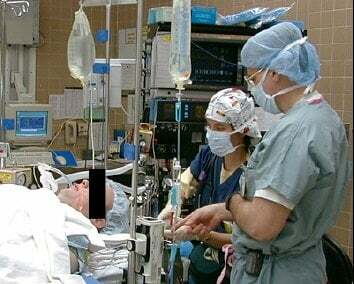 Here, a patient is intubated and connected to an anesthesia breathing machine. Potent inhaled anesthetics and nitrous oxide pass from the anesthesia machine in the background into the patient by way of the breathing circuit and endotracheal tube.